We all know that teaching is not a one size fits all activity. In fact, it is as varied as there are pupils in our schools and as effective and personal as the approach of each individual teacher. Taking all this into account, a pathway has been developed which will move pupils forwards in their knowledge, understanding and skills in a child centred, needs met, way. 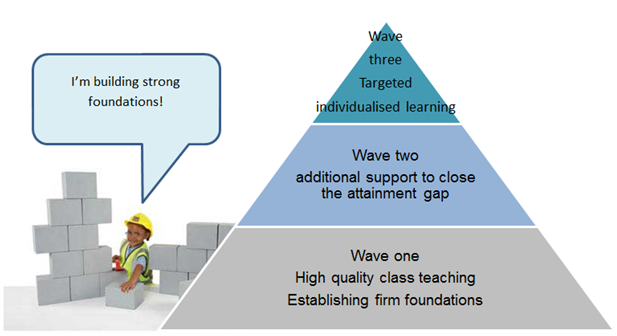 Through the path way it is hoped that teachers will be supported in both revising existing knowledge and given further ideas and strategies for developing their classroom practice at each of the three waves. A ssessments also are not one size fits all. Assessment is vital for enabling teachers to tailor make a program of relevant and effective reading experiences for pupils. Targeted class constituents for assessments fall under three main waves. Together with the Educational Psychologists, it is hoped that a range of screening and diagnostic tests be developed to aid strategic planning for each child. When using evidence based commercially produced interventions, it is vital to use them per the instructions, otherwise the desired outcome may not be experienced.